Reason to consider selling, just thinking I want to try a different car in the time I have left to enjoy this hobby. Which other cars are you considering ? BTW, "wrong color" means a color change repaint. He’s the seller, not the buyer. I understand that everyone has a different opinion of whats best for them. I have records on my car for everything back to Jim Ellis Porsche in Atlanta in 1988. Makes for a 11 page long spread sheet and very wide with columns. The re-paint which was done really well but short of bare metal which would have been a ridiculous waste for a driver has made me happy, red is so common and everyone I meet at any event really loves it. Never even got a mention previously. Gently used is for the weak of will and heart, nothing I own is "gently used". That's the story I'm happy with. Oh, and I'd love to drive an Ariel Atom. Planning to visit the factory in South Boston, VA and get the inside story on how they support the used spec. cars that are in the market selling periodically. You can pick up one of them sometimes for about equivalent money. They only get positive comments for being a ton of fun to drive. And Matt, I'd get the gearbox rebuilt in a skinny minute if it showed that it needed it at all. Has had more oil changes than can be counted and second gear likes to be done slowly sometimes, that's it. Just seems a waste to do it at this time. Last edited by Jesse16; 01-02-2019 at 01:28 PM..
Color sells. Someone out there is smitten with this. I would zero in on that. Assuming a swell paint job, I say north of $50K. On BAT, who knows, that might be low. 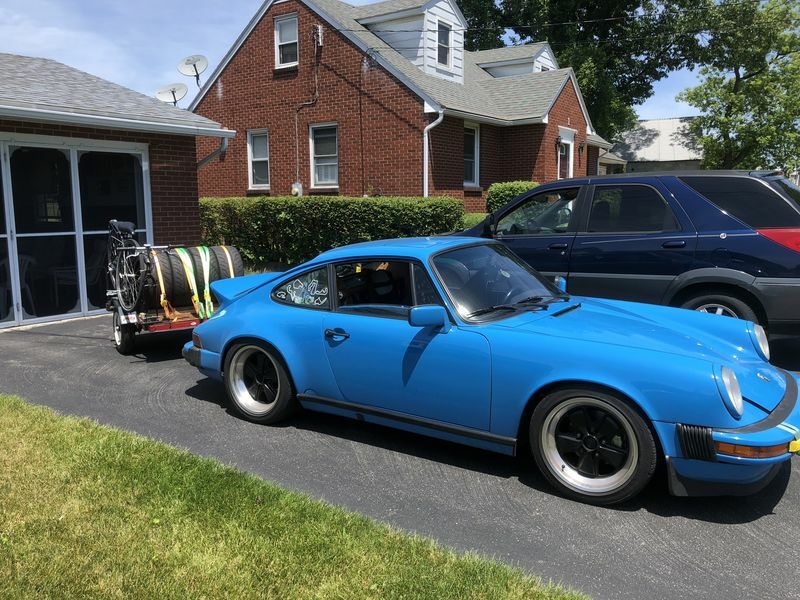 The ducktail plus working A/C and "tons of extra parts" makes it even sweeter. Yeah... $40K would be a complete steal. Not sure if troll or contrarian. Always way out there, anyway. As for the car - If you put it up for sale with a mid-40s ask, I doubt you'll get any movement. If you put it up at 42 you might get some nibbles and sell around 38. I will agree that "On BAT who knows" but you'll have to sort any nits and bite your tongue in the comments section. So how did you do on the sale? I think I did extremely well, sold it in less than 72 (like driving away and I have a bag of cash) hours from hitting the post on the PCA national web-site. If I knew how to sell cars, I could have even done better. Extremely well maintained trumped high miles big time and the color even though not original was a big selling point. Car looked and drove flawlessly which was my goal all along. Bought a track worthy Cayman S with plenty to spare. Nicely north of 40 and mid 40 was very doable. There are unique people out there who want nice ones and have the means. My buyer wanted the best driver possible. Congrats on the quick sale and bag of cash ! That's a sure bet the buyer is a flipper type. We might well see this reappear at a higher price. Nope, a believer and lover. Already sent photos of an extreme detailing and family inside. Just loves these cars, not his first air cooled car. Mine was the best driver available. Of course everything flips eventually, could say I flipped after 10 years. Last edited by Jesse16; 03-04-2019 at 03:25 AM..